Brittany Telford has a dilemma. Weddings give her extreme anxiety... and she is a wedding photographer. "I'll start shaking, my heart will start pounding, my brain will start racing with all the things that could do wrong," she says. "It's super scary." Brittany's not alone. One in three Americans will suffer some sort of anxiety symptom in their life, and women are twice as likely as men to develop anxiety. Dr. Elyssa Barbash at Tampa Therapy says there are several possible reasons why so many women have anxiety -- chemical, genetic, societal -- but they're also "more analytical" than men, and those worries pile up and speed up. Brittany doesn't take medicine for her anxiety attacks though. Instead, she seeks out natural remedies such as kava, a South Pacific plant with sedative powers. A bottle of liquid kava costs about $10. "Throughout the day I'll take a shot of it and it will stabilize your nerves," Brittany says. Mother Nature has provided plenty of remedies for anxiety. Most produce amino acids that inhibit overactive nerve stimulation. 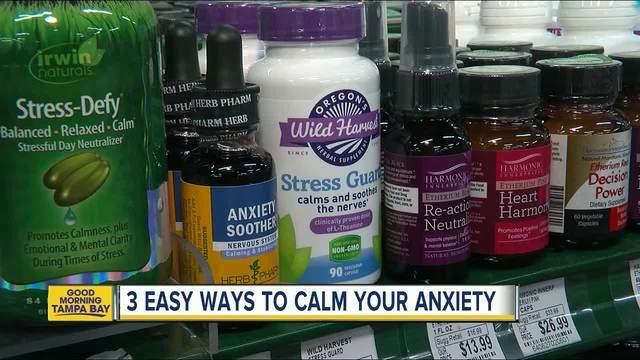 "That's all fancy wording to say it's going to calm the nervous system, relax the brain," says Collin Gow, a consultant at Abby's Health & Nutrition, which devotes large sections of the store to anxiety. While kava is good for general and social anxiety, the liquid Anxiety Soother -- a mix of kava, lavender and passionflower, three of the most potent anxiety fighters -- is better for more extreme panic attacks. Lavender is also effective as an oil for aromatherapy, which can calm anxiety. The skullcap flower also has soothing properties, so check that out. If you want to combine natural remedies with exercise, yoga is another anxiety fighter. As always, do your research. Consult a physician about what is right for you. And fair warning: Although kava works for me (a slow rolling calm), the liquid form tastes rough. Dilute in water and chase with juice.